The populations that YVY serves represent a broad range of ethnic, cultural and linguistic communities: about 15 languages are spoken at home by YVY children in addition to English. In order to raise to the challenge of understanding and responding to the needs of YVY children and families, in the spring 2006 YVY established a Research Institute that a) houses research projects that lead to a better understanding of YVY populations and their needs, b) improves assessments, with the input of YVY staff and parents and c) contributes to YVY educational policies and to YVY staff professional development. The findings that emerge from projects conducted at YVY are shared with regional, national and international partners so that they can benefit all children, families and communities. How do children develop in different cultural and linguistic settings? What are the universal, language-specific, cultural-specific patterns their development exhibits? How can this development be fostered or enhanced in cases of typical, delayed and atypical development? What are the underlying causes of delayed and atypical development and how to best address the child’s and family’s needs? How to distinguish between delayed, atypical and cultural-specific development? Here are some of the issues that Yeled V’Yalda Multilingual Development and Education Research Institute is seeking to address. 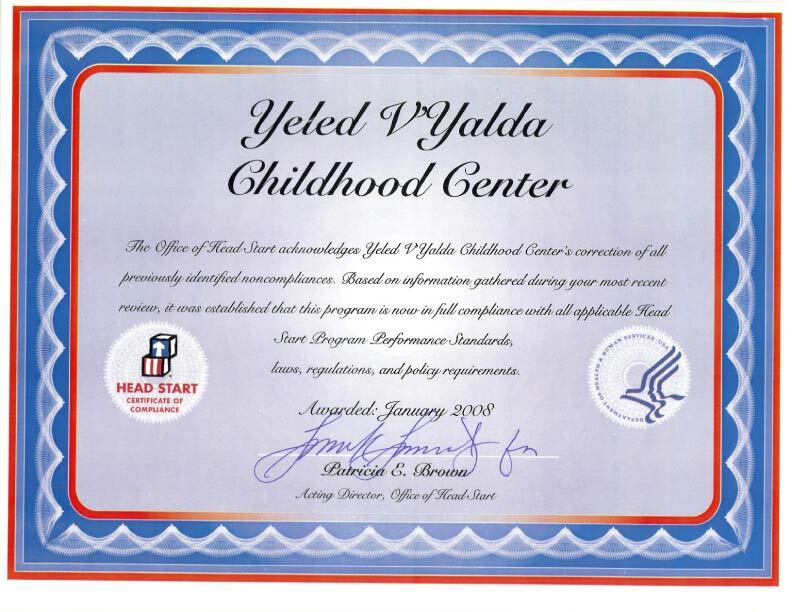 The heart of the YVYMDE Research Institute is the Yeled V’Yalda Early Childhood Education Center (http://www.yeled.org/) (2005 Outstanding Early Childhood Program Awards granted by the New York State Education Department Office of School Improvement and Community Services), one of the two largest Head Start Programs in New York City. Its population totals over 2,000 children representing an unsurpassed cross-section of languages and cultures in the US. This offers the institute an opportunity to pioneer assessment, intervention, and rehabilitation tools that will meet the needs of these children, their families and the health and education professionals who serve them while answering fundamental theoretical and empirical issues about child development and education that will serve all children. 8. Link between theoretical research and implications for education, intervention and rehabilitation. The Research Institute communicates the research findings that emerge from projects conducted at YVY as well as relevant outcomes of state-of-the arts findings published in a broad range of disciplines that pertain to young children’s education (including applied linguistics, cognitive science, early childhood education, health sciences, neuropsychology, developmental psychology, psycholinguistics, sociolinguistics and speech sciences) to YVY Management Board. This information informs changes in YVY educational policies. In 2008-2009, YVY Research Institute developed the Dual Language Policy now required by Head Start for all programs that serve children whose Home Language is not English, in collaboration with other YVY Early Head Start and Head Start programs and with YVY families. The policy reflects both Head Start directives as well as the in-depth knowledge of YVY populations that has emerged from the Research Institute research projects. c)	disseminate research-based information that positively contributes to children’s acquisition of English and of their Home Language to parents, policy makers and service providers (at and outside of YVY) and to institutions that train education and health professionals and researchers. Dr. Barrière has received interdisciplinary training in developmental psychology of language, education and neuropsychology at Birkbeck College/ University of London (UK), Toulouse University (France), the Child Neuropsychology Unit at the Salpetriere Hospital in Paris (France) and Johns Hopkins University. 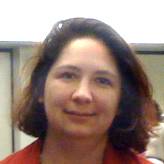 Her research has been supported by European (e.g. UK ESRC) and American grant-giving organizations (e.g. NSF) and disseminated in the peer-reviewed literature. It focuses on the acquisition of different languages; bilingual development; early literacy; typical and impaired development; intervention and the link between theoretical research and education policies and clinical interventions. Dr Barriere is currently developing assessment tools in little researched languages used by YVY children and investigating the comprehension of word-combinations by toddlers exposed to different languages. Dr Barriere is an Assistant Professor in the Department of Speech Communication Arts & Science at Brooklyn College/City University of New York where she teaches courses in Language Development, Emergent Literacy and Dual Language Learning. She is also a Research Associate at the Research Institute for the Study of Language in Urban Society/Department of Linguistics, City University of New York Graduate Center and a member if the Doctoral Faculty of Brooklyn College Department of Psychology and of the Speech Language and Hearing Sciences Department at the CUNY Graduate Center. 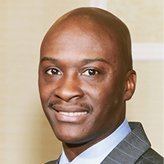 Dr. Ellis received his BSc in Psychology and Biology from Brooklyn College and his Medical Degree from Ross University School of Medicine. His multi-faceted contributions to community health and education have been rewarded by many prizes including the Vernal G. Cave Humanitarian Award, the Martin Luther King’s Fulfilling the Dream Award and the New York City Technical College's 2009 Best of Community Assistance Award. In Spring 2009 Dr Ellis was the Recipient of the Borough of Brooklyn City of New York Citation for demonstrating an extraordinary commitment to promoting community health and well-being through the development of responsive and outstanding services for all Brooklynites. In the same year he was an Honoree at New York City College of Technology Foundation at their Best of New York Award Dinner. In 2010 he was appointed Honorary member of the Jewish Faculty Staff Association (JFSA), New York City College of Technology, the City University of New York in recognition of philanthropic generosity and educational and humanitarian services to the community. Dr Ellis’s areas of expertise include wellness education, health policy, public health, the prevention and treatment of attention and memory disorders, eating disorders and the enhancement of the teaching of scientific subjects. Before joining YVY, Dr Ellis served as the Medical Adviser to the Commissioner of the Administration for Children and Families (ACF) and as a Special Assistant to the Secretary of Health and Human Services (HHS). Dr Ellis has is currently leading several new YVY initiatives to tackle important community issues such as asthma, diabetes and obesity. Do dual language learning preschoolers distinguish between the Hebrew and English writing systems that differ in a) the shapes of the letters and b) the directions of the writing in the early stages of exposure to literacy? To what extent do literacy skills transfer from one language to another? Does the transparency of the orthography of (vowelized) Hebrew have a facilitating effect over the opaque characteristics of English orthography in the early stages of acquisition of literacy? Do dual language learners of two writing systems take longer to master emergent literacy skills compared to monolingual children exposed to one writing system? In order to address these questions, 3;7 to 5 year old preschoolers were administered tasks that tap various sub-skills including invented spelling, letter naming, print recognition, language preference, direction of book opening, distinguishing alphabets, verbal analogies and vocabulary skills. In addition a detailed questionnaire on the demographic and linguistic contexts in which the children are raised was administered to parents and teachers' interviews were conducted to collect information on the pedagogical strategies to which the children are exposed. The data were collected on Hebrew/English-speaking children who attend Farragut Road/Canarsie Head Start program in the Spring and Summer 2011. The results are currently being processed and will be posted as soon as they are available. The aims of this study are to: a) identify the early acquisition patterns of the use of decontextualized language (i.e language that evokes events, object and people removed in time or space from the immediate context) ; b) investigate the similarities and differences across three languages- English, French and Russian- and cultures given that to date only one study focused on the emergence of this aspect of language acquisition in American English; c) to determine whether parental input has an impact on this aspect of language development. Transcripts of language samples of 1;10 and 2 year old toddlers interacting with their caregivers were extracted from the CHILDES database (MacWhinney, 2000). The coding system has been adapted from Adamson and Bakeman (2006) that considers Symbolic Highlighting, Spatial Displacement and Temporal Displacement. The results will have implications for the cognitive underpinnings of early language development and the identification of universal versus language and culture-specific acquisition patterns. The results are currently being processed and will be posted as soon as they are available. 2007-2008 Early Childhood Interfaces: Analyses of Demographic, Cognitive, Socio-emotional, Linguistic, Behavioral, Educational and Medical data collected on YvY population (> 2,000 low SES children aged 0 to 5, using more than 15 languages, > 10% with Individualized Education Plan) in 2006-2007. 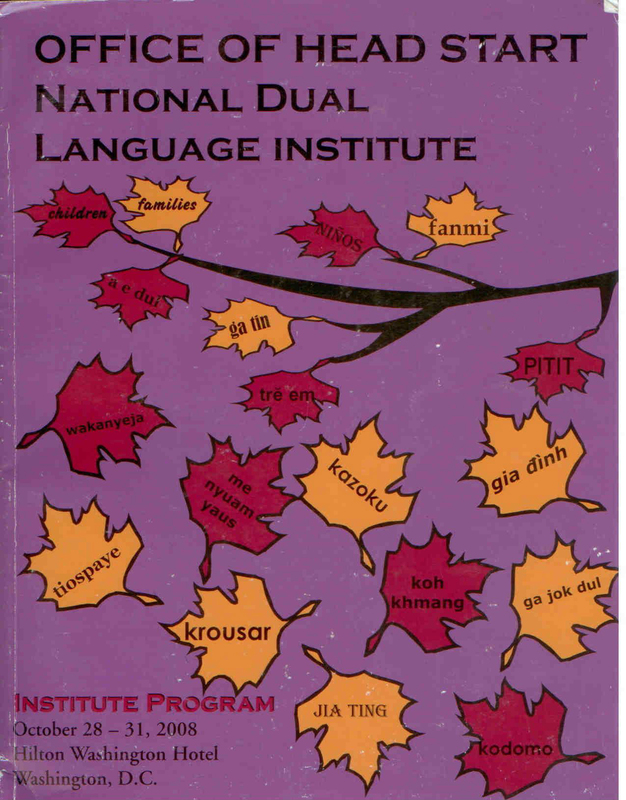 Acquiring one's native language is a tremendous achievement. Most 3 year olds already exhibit both a solid understanding of the linguistic exchanges that surround them, and also, within the limits set by their expanding vocabulary, a significant ability to express themselves in that language. Four main questions arise: How do they get to this point? Where do they start? Do they exhibit the same patterns in production (the forms they use) and comprehension (the forms they understand)? How much is tied to the particular grammatical properties of the language they are acquiring? Few non-contradictory answers exist, in large part because of the notorious difficulty of testing linguistic comprehension in very young children. With funding from the Linguistics Program and the Office of International Science and Engineering, Dr. Geraldine Legendre and Dr. Isabelle Barriere will seek answers to these and other related questions using recently developed non-invasive experimental methods. Based on measuring the duration of gazing at short videos paired with short audio descriptions that match or do not match the videos, these methods have been used to test linguistic comprehension in very young children acquiring English. The research team will apply such methods to the testing of children acquiring French, a language which has a richer system of marking tense, person, and gender distinctions than English. This novel study of comprehension in young children from a cross-linguistic perspective will inform the debate on, and attempt to resolve contradictory claims pertaining to, first language acquisition. Broader impacts include advancing the diagnostic of atypical linguistic development by establishing a benchmark for both typical production and comprehension, creating research opportunities for both undergraduate and graduate students at Johns Hopkins University, and fostering scientific dialogue with research communities abroad. Recent studies have revealed that executive functions a) constitute a strong predictor of school readiness (Duncan et al., 2007, Blair & Razza, 2007) and b) change rapidly during the preschool period (Rueda et al., 2005). The aim of this project is to develop and norm a sensitive tool that reflects the developmental stages of executive functions in 2 to 5 year olds. Children enrolled at Farragut Road and Silver Lake II are currently participating in this project. Noun-Phrases Are Part of the Building Blocks of Language. This research on the acquisition of adjective agreement studies the capacity of the young children to produce complex noun phrases (for example the small red balloon). We aim to collect data on the acquisition of this structure in Spanish-speaking children with and without language impairment. Learning Spanish Involves Learning Gender Agreement in the Noun Phrase. In Spanish, adjectives and other elements of the noun phrase must agree in gender (masculine or feminine) with the noun. Thus, ‘red car’ is carro rojo (masculine) but ‘red frog’ is rana roja (feminine). Children produce these structures at young ages. We can gain a better understanding of how children acquire agreement by studying agreement in the noun phrase. What Can Children with Language Impairment Do? What Is Difficult? The study of this structure in language-impaired children will inform us on the differences between normal and impaired development of this structure. Previous studies using play situations have shown some difficulties producing correct gender in Spanish-speaking children with language impairment. However, this study will systematically test this question. This Study Will Help us Understand the Acquisition of Other Languages. We will compare the abilities of children acquiring Spanish to those obtained in French-speaking children who are participating in a similar project conducted by the same investigators in Montreal, Canada. This cross-linguistic comparison will allow us to address issues regarding the relationship between language form and ease of acquisition of linguistic structures. Studies of Early Acquisition Help Us Understand Important Steps in Development. Since pre-school age is a critical period for linguistic development, it is essential to identify language learning problems as soon as possible. Presently, very few standardized tools exist for the evaluation of language acquisition of Spanish-speaking children. Clinical evaluation tools could allow speech-language pathologists to evaluate children at risk for speech and language disorders. This study will eventually lead to the creation of better evaluation tools. Abstract: This research looks at children’s early word combinations (sentences) and the relationship between the sentences children say and the sentences they understand. By carefully controlling the input the child receives and simplifying the task of saying a sentence, Dr. Bencini has shown that: normally developing monolingual children’s early sentences are more adult-like than previously thought; children are able to understand complex sentences earlier than previously thought. Understanding the benchmarks of typical development is the first step in early assessment of language skills. This in turn can inform interventions when deficits are found. These resources have been prepared to assist clinicians and educational professionals who service dual language learners from different language backgrounds. The educational professionals and clinicians should feel free to contact the institution if they need information about other languages. This is a work in progress and will regularly be updated. 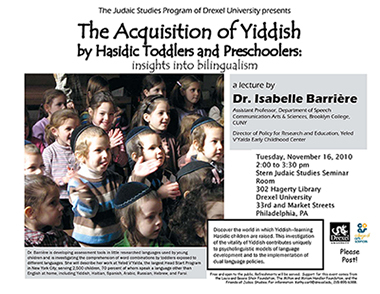 Barrière, I., Blum, Y., Gillig, L. & Meisels, M. (July 2011) Effects of Quantity and Quality of Input and of Language Contact in Heritage Language Learners: Insights from the Acquisition of Yiddish by Hasidic Toddlers. Symposium on " Bilingual development in contexts of variation and change" 12th	International Congress for the Study of Child Language, Montreal, Canada. Legendre, G., Barrière, I., Goyet, L., Nazzi, T. (July 2011) Is there a production/comprehension asymmetry in the acquisition of verbal number marking? Evidence from French. Symposium on "Detecting and interpreting agreement morphology: cross-linguistic issues" 12th International Congress for the Study of Child Language, Montreal, Canada. Barrière, I. (March 2011) Fostering Successful and Long-term bilingual development, (Russian and Hebrew-	speaking) Parents Workshop, Organized by the Edith & Carl Marks Jewish Community House of Bensonhurst and held at Park Slope Jewish Center, Brooklyn, NY. Nazzi, T., Goyet, L. , Barrière, I., Kresh, S., Legendre, G. (March 2011) New Evidence of French-Learning Infants'Sensitivity to Irregular Subject Verb Agrrement at 18 Months, Biennal Meeting of the Society for Research in Child Development. Barrière, I., Goyet, L., Nazzi, T., Kresh, S. & Legendre, G.(November 2010) The Representation of Subject-Verb Agreement in French-learning Toddlers: New Evidence from the Comprehension of an Infrequent Pattern of Pseudoverbs. Boston University Conference on Language Development 35. Legendre, G., Barrière, I., Goyet, L., & Nazzi, T. (September 2010) On the acquisition of implicated presuppositions: Evidence from French personal pronouns. Generative Approaches to Language Acquisition North America, Toronto, Canada. Barrière, I. (August 2010) Will the 2008 Head Start Dual Language Policy help Yiddish continue to thrive in Brooklyn Hasidic Communities? Raanana, Highland Mills, Orange County. Barrière, I., Legendre, G., Nazzi, Goyet, L. & Kresh, S. (July 2010) L'acquisition de l'accord sujet-verbe par les jeunes francophones natifs entre 14 et 30 mois: préférence, comprèhension et environnement linguistique. 2nd World Congress of French Linguistics, New Orleans, USA. Legendre, G., Barrière,I. Nazzi, T., Goyet, L., (January 2010) French Personal Pronouns and the Acquisition of Implicated Presuppositions. Linguistic Society of America Annual Meeting, Baltimore. Barrière, I., Blum, Y., Gillig, L. (December 2009) Word-order, Pro-drop and Auxiliary Selection in Varieties of Contemporary Brooklyn Yiddish. Conference on Yiddish Language Structures, University of Regensburg, Germany. Legendre, G., Goyet, L., Barrière, I., Kresh, S., Nazzi, T. (November 2009) Sensitivity to Irregular French subject-verb agreement at 18 months: Evidence from the Head Turn Preference Procedure. Boston University Conference on Language Development 34. Barrière, I., Blum, Y., Gillig, L. & Kresh, S. (June 2009) Changing the cultural and communicative status of Yiddish in the Hasidic community by investigating its acquisition. Bloomsbury Round Table in Culture, Communication and Cognition, Birkbeck College, University of London, UK. Ellis, G.V. (May 2009) Increase Awareness and Knowledge of Important Factors in Prevention of Chronic Diseases (e.g. Diabetes, Heart Diseases) Focus on Nutrition & Exercise. Anderson School of Management, University of California/ Los Angeles. Barrière, I. 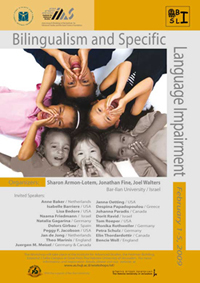 (March 2009) Bilinguality and Impaired Language Development. 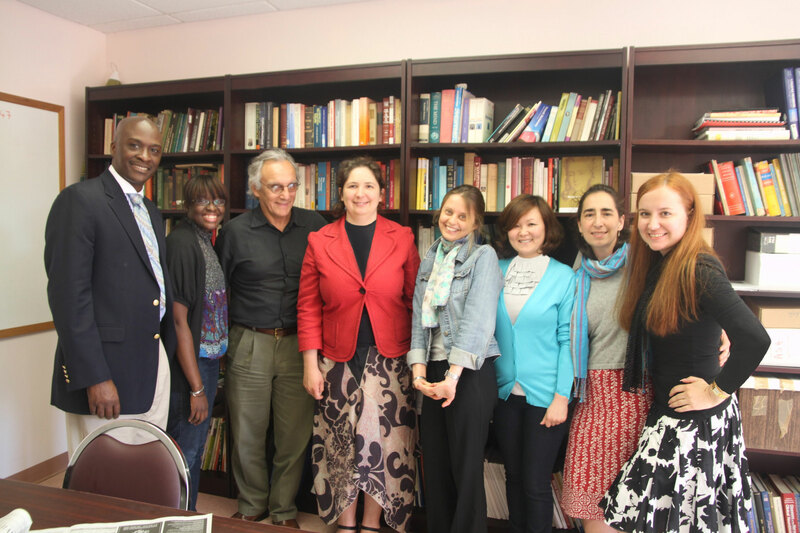 Brooklyn College Department of Speech Science Master Clinicians Series. ASHA CEU-credit (0.2). Barrière, I. (January 2009) The distinction between low percentage of exposure and language impairment: insights from the acquisition of Yiddish and English. Bilingualism and Specific Language Impairment, Institute for Advanced Studies, Hebrew University of Jerusalem, Israel. Barrière, I. (August, 2008) The vitality of Yiddish among Hasidic infants and toddlers in a low SES preschool in Brooklyn. W. Moskovich, L. Finberg, M. Chlenow (eds.) The 2008 Czernowicz Yiddish Language International Centenary Conference, Czernowicz, the Ukraine. Ellis, G.V. (May 2008) Effects of Obesity on a Child’s Mental Health. ACS/CCHS Special Needs Forum for Education Professionals, NYC. Barrière, I., Martohardjono, G. & Ellis, G.V. (May 2008) Languages and Pre-literacy skills in low-income preschoolers in New York City. Research Institute for the Study of Language in Urban Society Annual Forum. Barrière, I. (October 2007) Les facteurs qui déterminent le développement morphosyntaxique chez les bilingues. CHU Ste Justine Research Center Mother and Child University Hospital Center. Université de Montréal. Barrière, I. (May 2007) Talk to me: helping families and their young children to engage in communication. 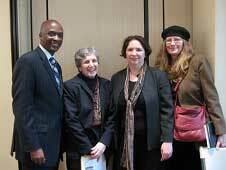 Conference Families as partners: strategies for effective early intervention partnering, New York University. Barrière, I. Halberstam, F., Smedesdran, S. & Lambova, M. (May 2007) Environmental influences on the early bilingual (Spanish/English, Yiddish/English) development of low SES children in NYC. Annual Forum of the Research Institute for the Study of Languages in Urban Society, CUNY Graduate School. Barrière, I. 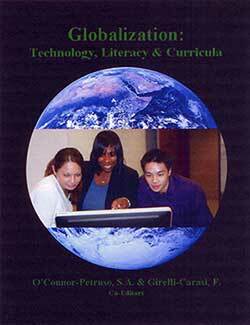 (January 2007) Screening and assessments of young children from culturally and linguistically diverse backgrounds. Brooklyn Special Education cluster, New York. Barrière, I. & Monéreau-Merry, M.M. (in press) Trilingualism of the Haitian Diaspora in NYC: Current and Future Challenges. In O. Garcia, B. Otcu & Z. Zakharia (eds) Bilingual Community Education. Barrière, I., , Goyet, L. , Nazzi, Goyet, L. & Legendre, G. (2011) The Representation of Subject-Verb agreement in French-learning toddlers: New Evidence from the Comprehension of an Infrequent Pattern of Pseudoverbs. Proceedings of Boston University Language Development conference 35. See original here. Barrière, I. (2010) The vitality of Yiddish among Hasidic infants and toddlers in a low SES preschool in Brooklyn. W. Moskovich, (ed.) Yiddish - a Jewish National Language at 100. 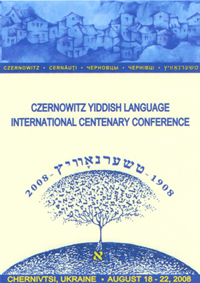 Proceedings of Czernowitz Yiddish Language 2008 International Centenary Conference,Jerusalem-Kyiv, 2010, series "Jews and Slavs",vol.22: 170 - 196. Legendre, G., Barrière, I., Goyet, L. & Nazzi, T. (2010) Comprehension of infrequent subject-verb agreement forms: evidence from French-learning children. Child Development, 81 (6): 1859-1875. Dr. Barbara Zurer-Peason of the University of Massachussets/Amherst, whose book “Raising a Bilingual Child: A Step by Step Guide for Parents” was awarded the 2008 Parenting Media Award gave a presentation on Dual Language Learning to YVY Education Professionals and Clinicians that was open to students and professors from other institutions. Prof. Joel Walters of Bar lIan University visited several YVY sites and presented Bilingual Development in Young Children: Insights form Code-switching. Lauren Swensen, MA and Dr. Letitia Naigles, from the Department of Psychology at the University of Connecticut, presented Positive effects of Maternal Input on the Language Development of Children with Autism to parents of children enrolled in the YvY ABA Program. Dr. Sharon Armon-Lotem, from the Department of English and Linguistics at Bar Ilan University, presented Distinguishing Bilingualism from Specific Language Impairment in Bilingual Children with Specific Language Impairment to the YvY therapy staff and professionals from several New York universities and non-profits. Dr. G.V. Ellis gave a presentation titled “Increase Awareness and Knowledge of Important Factors in Prevention of Chronic Diseases (e.g. Diabetes, Heart Diseases)” to the staff at Staten Island (Silver Lakes I & II), Farragut Road and Borough Park sites. Dr. Isabelle Barriere presented the new Dual Language Policy to the Policy Council. Dr. Isabelle Barriere presented the new YVY Dual Language Policy to Head Start Professionals. Dr. Isabelle Barriere presented the new YVY Dual Language Policy to Early Head Start Professionals. Dr. Ellis, G.V. gave a presentation on the Effects of Obesity on a Child’s Mental Health to parents and staff at Staten Island Silver Lakes I & II. Dr. Isabelle Barriere presented New Brigance Forms and Profile & Progress of YvY Children for ACF HS teachers at the Borough Park Professional Development Day. Dr. Isabelle Barriere presented Profile & Progress of YvY Children for HS and EHS teachers at the Staten Island Professional Development Day at Silver Lake I & II. Dr. Isabelle Barriere presented a Workshop on Cognitive Development for parents of YvY HS and ESH children at Silver Lake I.
Dr. Isabelle Barriere presented a workshop on Language Development for parents of YvY HS and EHS children at Silver Lake I. Public transit: Take a number 3 subway to Sutter Ave – Rutland Rd station, then take the B47 toward Kings Plaza to the corner of Ralph Av and Farragut Rd, or take the B/Q line to King’s Highway station, then take the B82 to Ralph Av, and walk one block north to Farragut Rd. From Brooklyn College: Take the B06 to Flatlands and 76th St., cross Flatlands and walk two blocks to Farragut Rd.